Screw these LED light tubes into the air valves on your bike tyres and let the show begin! Each tube automatically turns on a light show at dusk while riding. 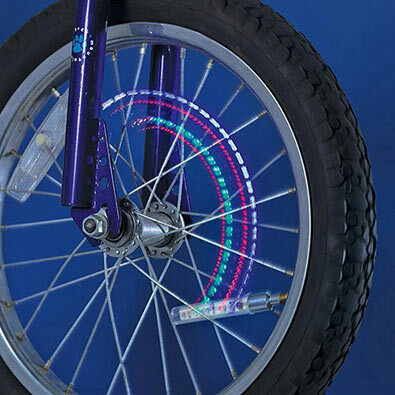 The ten colourful LED lights automatically turn on at dusk, channeling through a streaming sequence of blinking while the wheels turn to illuminate your bike. Set of two. Each light measures 10cm long and requires 3 button batteries, included. Recommended for ages 13+. Keep your electronic area spotless! Our slim, easy to carry desktop vacuum cleans between computer keyboard keys, card reader slots and other hard to reach places around your computer area. With strong suction power, it will keep your desktop clean and tidy. Includes slim nozzle brush and nozzle holder. A great gift for any computer buff. Measures 18cm x 4cm. Requires 2 "AA" batteries, not included.